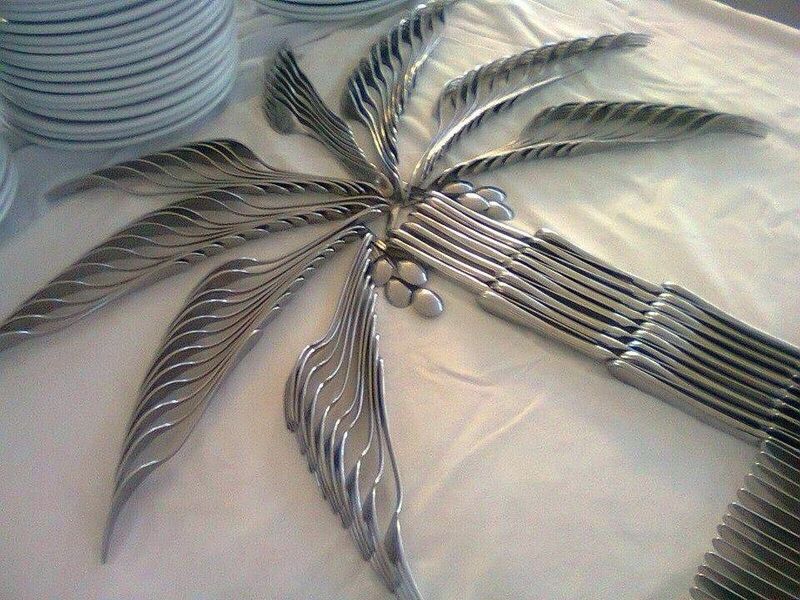 Don’t hide your silverware away in its storage box or in a buffet drawer. Get it out and show it off! Whether you have mismatched silver cutlery or grandma’s complete set of silver, learn how to display your silverware as a functional piece of art. Here are a dozen decorative silverware displays that will motivate you to get your special silver flatware out of the closet and onto your table. This Heart Shaped Silverware Display from Must Love Weddings would be perfect for a cake table. If your wedding is lower-budget, you could use silver-colored plastic utensils! Nell Hill’s blog is a wonderful resource for unique decorating ideas. I love how the silverware is displayed in assorted pieces of china, then all put on a silver serving tray. Jacqueline from Cabin & Cottage placed her silverware in a beautiful antique pewter jug. She places it on the table and says that early guests can set the table if they want to help. Great idea! Here’s another great decorating tip from Nell Hill’s. Mary Carol is serious about her morning coffee so she built her own coffee station on her kitchen counter using items like a vintage creamer and sugar bowl. I especially like the demitasse spoons displayed in a crystal glass. Courtney from French Country Cottage sets a very romantic holiday table. I love how the silver cutlery is displayed in a pretty vintage vase. Susan from Romancing the Home polished up her silver flatware and put them in this lovely glass container. I love her eclectic mix of vintage pieces. Suzanne Duda obviously loves shabby chic. How do you like her fantastic collection of mismatched silverware placed in a silver urn? I love it! You don’t have to speak to this Spanish to appreciate the decorating sensibilities found on this Spanish blog ForoDecoracion. Here, various unpolished pieces of silverware are displayed in beautiful crystal containers then placed on a silver tray. Marty from Thrifty & Chic placed odd pieces of family silver in a crystal pitcher then put under a cloche. This vignette is magnificent. Don’t have lots of crystal , silver platters, or cloches lying around the house? Me neither. But I do have some antique crocks. I love this display of silverware in vintage crocks and from Keeping It Cozy. My Sweet Savannah employs rustic decor in her kitchen. I love how Melaine placed her old silverware in mason jars, then put the jars in a wire basket from a pressure cooker. It’s not only functional, it makes a beautiful decorative centerpiece. Any of these decorative silverware displays would look wonderful on a lace tablecloth. If you don’t have any vintage tablecloths of your own, consider adding a new lace tablecloth to your linen closet. Bright Settings sells four different types of Lace Tablecloths. Poly Cove Lace comes in white and ivory, as does Vienna Lace and Lucerne Lace. Garden Lace features pink, blue, green, and orange accents. You just have to see these to appreciate their delicate beauty. If you’re planning a vintage wedding, you should consider renting Lace tablecloths. They look wonderful as table toppers overlaid on colored tablecloths. Which would look best with your wedding colors, white or ivory lace? Call 1-800-327-6025 to find out about our free fabric swatch program or to speak with one of our resident tablecloth experts during normal business hours. In the meantime, get your beloved silverware out of the cupboard and find a pretty container to display them in. Surround yourself with things you love!